For his nephew, the architect and furniture designer, see Charles Eastlake. Sir Charles Lock Eastlake PRA (17 November 1793 – 24 December 1865) was a British painter, gallery director, collector and writer of the early 19th century. Eastlake was born in Plymouth, Devon, the fourth son of an Admiralty lawyer. He was educated at local grammar schools in Plymouth and, briefly, at Charterhouse (then still in London). He was committed to becoming a painter, and in 1809 he became the first pupil of Benjamin Haydon and a student at the Royal Academy schools in London — where he later exhibited. However his first exhibited work was shown at the British Institution in 1815, a year in which he also visited Paris and studied works in the Louvre (then known as the Musée Napoléon). 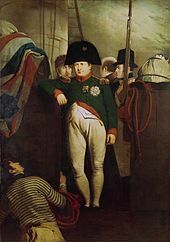 His first notable success was a painting Napoleon on Board the Bellerophon in Plymouth Sound (1815; National Maritime Museum, London). Like many other people at the time, Eastlake had hired a boat to take him to the ship on which Napoleon was held captive in Plymouth harbour. He sketched him from the boat. Despite being based predominantly in mainland Europe, Eastlake regularly sent works back to London to be exhibited, and in 1827 he was elected a member of the Royal Academy. Three years later, he returned to England permanently where he continued to paint historic and biblical paintings set in Mediterranean landscapes. As an art scholar, he translated Goethe's Zur Farbenlehre (Theory of Colours, 1840). He edited with extensive and valuable notes the 'Handbuch der Geschichte der Malerei (Handbook of the History of Painting) by Franz Kugler, which in its first English version was translated by 'A Lady', Mrs. Margaret Hutton. These publications and Eastlake's reputation as an artist led to his nomination in 1841 to become secretary of the Fine Arts Commission, the body in charge of government art patronage. In his On Vision and Colors, § 14, Schopenhauer praised Eastlake's translation of Goethe. Eastlake, the painter and gallery inspector, furnished his countrymen, in 1840, with such an excellent translation of Goethe's theory of color that it is a perfect reproduction of the original and reads more easily; in fact, it is understood more easily than the original. Having already advised the National Gallery, London on acquisitions, he was appointed the Gallery's second Keeper in 1843, a post he later resigned to resume writing and painting. In 1845, he was elected into the National Academy of Design as an Honorary Academician. From 1850–1865, he was the second president of the Birmingham Society of Artists. 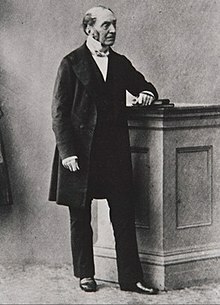 Elected President of the Royal Academy and knighted in 1850, he became a notable figure in the British art establishment, being appointed the first President of the Photographic Society in 1853 and, in 1855, the first Director of the National Gallery. His directorship was marred by the signal failure of the National Gallery to fulfill the terms of the bequest of J.M.W.Turner, his erstwhile friend. Cambridge University awarded him an honorary degree in 1864. Funerary monument, Kensal Green Cemetery, London. 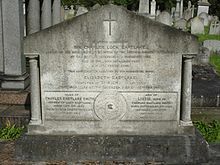 Eastlake died in Pisa, Italy, on Christmas Eve 1865, and is buried at Kensal Green Cemetery, London. His will provided for the Gallery to purchase his own collection of paintings. Lady Eastlake sold her husband's art history book collection to the Gallery's library. Materials for a History of Oil Painting (1847). A second volume was published posthumously in 1869. Contributions to the Literature of the Fine Arts (1848). ^ Sir Charles Lock Eastlake, National Portrait Gallery, London, NPG 3944(22), 17 July 2013. Retrieved 17 July 2013. ^ Monkhouse 1885, p. 330. ^ Goethe's Theory of Colours: Translated from the German; with Notes by Charles Lock Eastlake, R.A., F.R.S. London: John Murray. 1840. Retrieved 18 October 2017 – via Internet Archive. ^ a b Rossetti 1911. ^ Anon (1933). "The Spring Exhibition, 1933 (catalogue)". RBSA. ^ "Eastlake, Charles Lock (ESTK864CL)". A Cambridge Alumni Database. University of Cambridge. ^ Monkhouse 1885, p. 333. Catalogue of the National Gallery (Wornum), and books mentioned in the text. Rossetti, William Michael (1911). "Eastlake, Sir Charles Lock" . In Chisholm, Hugh (ed.). Encyclopædia Britannica (11th ed.). Cambridge University Press. Wikimedia Commons has media related to Charles Lock Eastlake. "Archival material relating to Charles Lock Eastlake". UK National Archives. This page was last edited on 4 March 2019, at 05:55 (UTC).